Do you ever go to the grocery store hungry? It’s almost always a bad idea, but this time I was inspired. While perusing the marinades, I came upon this red curry paste and decided to make something fancy for this week’s meal prep! And by fancy, it seems difficult but is actually super simple! If you are wanting the meal to be low carb & higher protein, sub the noodles for spaghetti squash or spiraled veggie “noodles” and increase the chicken from 3oz to 4oz. 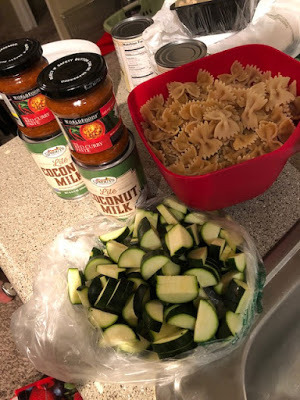 And since you will be cooking the zucchini, sauce and chicken together, I always assume the mixture accounts for 1.5oz and the chicken is the rest.